Having watched TV via Canal + for most of the years that we lived here, Pam and I decided that we'd like UK TV as an alternative. Apparently the very best way to get UK TV is via a satellite dish set to receive Freeview. With the right size dish, you can even get HD TV. There is a set up cost but after that it is free of charge. The thing is that we don't particularly want a giant dish on our roof terrace, we already have a discreet Canal + dish up there and we don't care to have another if we can avoid it. The alternative we found was IPTV where you receive rebroadcast TV via a set top box and your internet connection. I knew that our connection was fast enough and stable enough to receive streaming video. I even ran a wired connection from my router to the location where the set top box would be located. In theory, IPTV should work well for us. I researched the possibilities and came to the conclusion that a paid for service would be best. For well over a year now, we have been able to watch live TV and catch up programmes from a company called BEST IPTV. This is not an Android solution which would essentially be free but a paid for subscription to BEST. We have a MAG 254 box which decodes the information to the TV. To be honest, it has never been flawless. There were times when the picture stuttered and catch up wasn't always available for some reason or other but mostly it was fine. That was until about two weeks ago when live TV suddenly stopped working. All we get now is a black screen when we try to go to any of the programmes on the list. I therefore wrote to BEST IPTV to enquire about the issue. It seems that they have a number of clients, who use Telefonica as an ISP, experiencing the same problem as us and their technical department is supposedly looking into it. My gut feeling is that Telefonica are blocking the IP address of BEST's live server. The reason they would do this is to reduce the bandwidth that BEST's clients are consuming. Although we have an unlimited connection, Telefonica has a responsibility to all of its clients. They cannot allow one sector to hog the connection. Most ISPs do this when they find clients that take up more than their fair share of the bandwidth. If BEST IPTV cannot resolve the situation we could get our money back and move to a different provider. However, it may only be a matter of time before that company has their service blocked by Telefonica. We could investigate running our connection via a VPN (virtual private network). For a monthly subscription, you can mask your internet connection by using one of these services. Apart from the security this provides, you can make it look as though you are connected to the internet via another country e.g. the UK. I'm not sure how that would help though if Telefonica are blocking BEST's server. We could change our ISP to another like Jazztell or Orange or even investigate the fibre optic connection offered by TV Horadada (formerly Bitel). However, as any one who has tried will tell you, releasing yourself from Telefonica can be torturous. We may end up going back to watching just Canal + which we are still paying for. The picture quality from the satellite is excellent and there are programmes on there that we miss. Sadly, not one of my photographs. This came from Flickr Explore and was taken by David Sangüesa. Better still, stay away from where they are working. 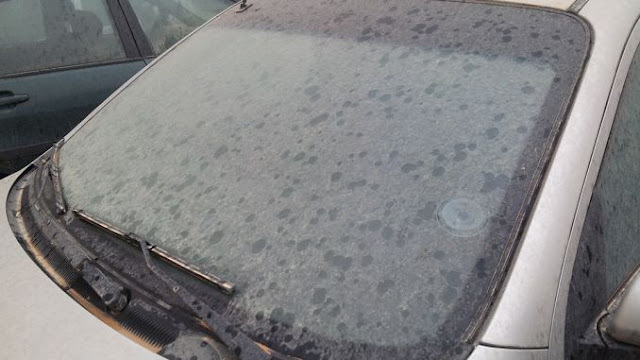 Don't bother cleaning your car or putting out any washing for the next couple of days. Look up to the sky and you can see that it is laden with Sahara dust brought over from Africa. Rain is forecast for this morning and with that rain, everything will be covered in dust. The Spanish call it “lluvia de sangre” because the dust is often a reddish brown colour. We just call it mucky rain. There is now a question mark about whether Wayne Rooney will stay at Manchester United or take a lucrative offer to play in the Chinese Super League. The current window of opportunity closes at the end of this month. When asked about this, Jose Mourinho has said you need to ask Rooney. He has no intentions of forcing the player out, in fact he would like him to stay with the club. However, he doesn't seem to want to play Rooney and admits that the team plays better without him. This just highlights the crazy world of football where money does not seem to matter. Wayne Rooney is paid an incredible £300,000 per week for sitting on the bench. Where else would anybody paid even a fraction of that for essentially doing nothing? Since he signed his last contract in 2014, Rooney has cost the club £47,007,080. Each year he earns (I use that word lightly) £15,600,000. Surely, there must be someone at United, if not Mourinho, who sees the sense in encouraging Rooney to go. We are already suffering as a result of Brexit and Article 50 hasn't even been triggered, As soon as the vote was counted, the pound lost strength meaning we got fewer euros each month. People said, don't worry it will be temporary, the pound will pick up in time. Well that hasn't happened yet and there is no sign of it happening in the near future. As worrying as that may be for us, it is totally eclipsed by what may happen to our entitlement to free health care. As things stand, Britain reimburses Spain for our healthcare under a reciprocal agreement. All that may go unless some alternative agreement is made before Brexit is finalised. It is a requirement for our continued residence that we have provision for our healthcare just as it is a requirement that we have a sufficient income to maintain ourselves. When Pam and I went to renew our "residencia", those were the two basic proofs that we had to show before receiving our cards. Unless there is some agreement made for post Brexit, we will be in limbo. 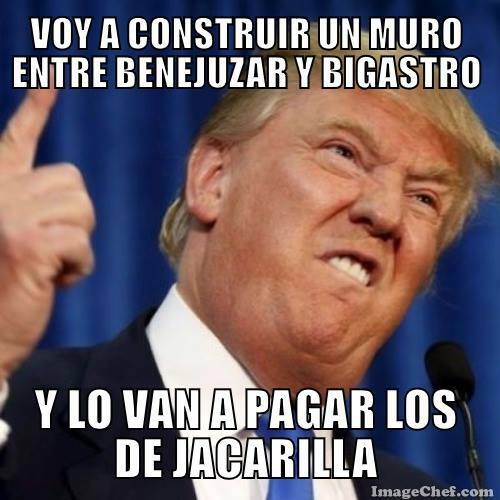 Spain cannot and will not foot the bill for us. Our choices would be to either pay for private health care or return to Britain. We won't be kicked out because we have permanent residence status, just won't be able to visit the doctor or get treatment in hospital. There has already been a lot of talk about what will happen to the status of EU nationals living in Britain but very little about British nationals living in the EU. According to reports in several newspapers, there is a looming crisis in the British education system created by an acute shortage of teachers. Numbers of pupils in secondary schools are expected to spike by more than 500,000 to 3.3 million by 2025. Set that figure against the fact that the overall number of full-time teachers in secondary schools fell by 10,000 between 2010 and 2015 and you can sense the problem. A YouGov poll found that 53 per cent of teachers were considering leaving teaching and it wasn’t just experienced senior staff. 11,000 young teachers actually leave in training, an exodus that has tripled in the last six years and points to a terrible loss of energy and new talent into teaching. Shortages lead schools to spend £733million on supply teachers from agencies. Apart from the stress on school's budgets that are being constantly cut, a supply teacher can often be just a "bum in the classroom" because they are used to fill in for subjects that they have no specialisation in. Why do so many teachers want to leave? A regime of inspections by OFSTED which seeks to destroy rather than support teachers has not helped. An increasing workload has not helped either. Teachers are weary and feel undervalued by governments that constantly criticise them and pick faults in their work. When did you ever read a report by government that said teachers were doing a great job? Instead of praising the good work that many do, it is easier to find fault with the few who fail. During term times, many teachers work late into the night marking and preparing for their lessons. And those long holidays that people complain about are often cut into by visits to the school just to keep up with classroom management. There is also a problem for teachers who, too often face low level disruption in their classrooms. Exclusion units that helped in these cases became unfashionable as teachers were told that inclusion was the right of every pupil. You could sense the logic when you saw the same children spending much of their time outside their normal classroom. Exclusion units tended to offer simple repetitive tasks to occupy the children rather than any actual teaching. Of more concern than minor disruption, in an increasing number of cases, teachers have also had to suffer abuse, either mental or physical, from their empowered pupils. Going to work only to be bruised in this way is no fun. Often, the teachers are told that it is their fault, the abuse is a result of their failing. Teachers, perhaps more than most other workers, need support and guidance to make the most of their pupil's abilities. Sadly, it is easier to dismiss failing teachers than it is to support them. All those adverts about a rewarding and worthwhile career must seem to be a joke to many in British classrooms today. When I was at school as a pupil, teachers could touch a child without being accused of all sorts of nastiness. At times, it may have been to discipline them, at other times to offer praise or comfort. It was normal and expected. Then the whole business of physical contact became an issue as children and their parents chose to wreck teacher's careers by making all sorts of accusations. In some cases, there may have been a foundation to the claims but mostly they were just malicious attempts to get back at a teacher who the children did not like. Teachers, quite rightly, became cautious and their unions advised them against any sort of physical contact. As an Assistant Headteacher, that posed a problem for me because there were times when I had to break up a fight and the only way was to drag one of the pupils off the other. In the case of two boys fighting that was less of a problem than where the scrapping pair were girls. When boys fight, they generally stand apart and throw punches; girls, on the other hand, get stuck in and pull hair or anything else they can grab. You have to literally pull them apart to stop the fight. Now, experts claim that teachers who avoid physical contact with children in the classroom are guilty of child abuse - really! Members of the British Psychological Society (BPS) say that teachers who do not touch children when they are happy, upset or worried could in fact cause harm and hinder pupils’ development. So, it is a case of dammed if you do and dammed if you don't. Top marks go the La Pedrera Association for the Disabled who led the parade yesterday morning. They were the only group to actually perform for us. Dressed as planets, they circled around as they passed down the street. Cristina de Borbón, sister of Spanish King Felipe VI, has been acquitted of tax fraud complicity in a high-profile corruption trial known as the Nóos case. Her husband Iñaki Urdangarin, considered one of the masterminds behind a scheme that obtained no-bid contracts from regional governments, has been sentenced to six years and three months in prison. He has been found guilty of embezzlement, fraud, influence peddling and tax crimes. The court has also demanded that he pay a €512,000 fine. Although Cristina de Borbón has been cleared of the criminal charges against her, she will have to pay a fine of €265,088 for her role in the scheme. The royal was never charged by either public prosecutors or tax authorities, but rather on the basis of a private prosecution. Urdangarin and his former business partner Diego Torres were behind the scheme that secured over €6 million in public contracts won for organising sports and tourism events. The contracts were obtained through no-bid awards that favoured a non-profit foundation called Instituto Nóos, run by the partners. Urdangarin allegedly leveraged his position as a member of the royal family to open doors within regional government structures. Cristina allegedly used an Aizoon credit card to make personal purchases – including dance lessons and children’s clothing – then claimed tax deductions on her 2007 and 2008 filings. The charges against the king’s sister were not brought by state prosecutors or by tax authorities, but by a private prosecution by a far-right anti-corruption group called Manos Limpias (Clean Hands), which has since been dismantled after its leader Miguel Bernad was arrested. Investigators found that Bernad had tried to extort the royal’s defense lawyers for a €3 million payment in exchange for dropping the charges against her. The case further damaged the royal family's image and is thought to be partly the cause of Juan Carlos' decision to abdicate the throne in June 2014 in flavor of his son Felipe. The Nóos case, while large in itself, is merely an offshoot of a much wider probe into the construction of a sports arena in Palma de Mallorca that has already resulted in a criminal conviction for Jaume Matas. The Palma Arena case, which put the spotlight on political corruption in the popular Mediterranean island archipelago, has been broken down into 28 separate sections, of which Nóos is the 25th. The story of graft and patronage in the Balearics feeds into other high-profile corruption cases in Spain, among them Gürtel, whose leaders were recently sent to prison for bribing officials in Valencia in exchange for government contracts. So, even the people who brought the charges against the Princess were guilty of corruption. It makes you wonder if there is anybody of authority in Spain who is not corrupt. Yesterday, we had a short thunderstorm during which lightening struck down to land nearby. At first, many thought it might have been an earthquake but there is no report of any incidences in this area. There were actually two lightening strikes, one positively charged and the other negatively charged, two kilometres northeast of Rafal at 16:01. The history of this region has been deeply linked to the occurrence of earthquakes - note the darker colour on the map. We live in a geologically active area, in constant evolution, the result of the collision between the Eurasian and African plates. With an estimated intensity of VIII and its epicentre in Orihuela, that earthquake destroyed the major mosque in the city, as well as some buildings of Arab origin in Guardamar and whose ruins are still visible today. The best known earthquake though was on March 21, 1829. 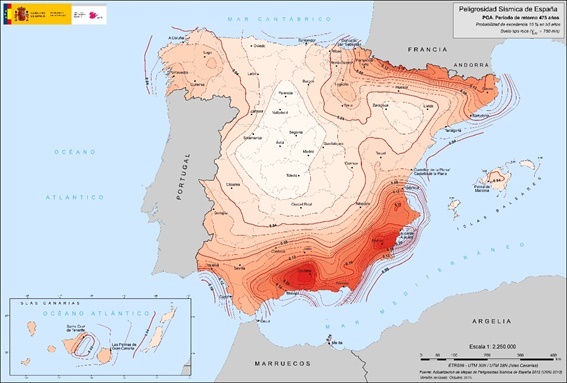 With its epicentre in Torrevieja that one left almost a thousand people dead and destroyed thousands of houses. Three leading figures in the Gürtel case, a major political corruption scheme affecting Spain’s ruling Popular Party (PP), have been sentenced to 13 years in prison each by the Valencia region’s High Court. Francisco Correa, considered the mastermind behind the bribes-for-kickbacks network, and his aides Pablo Crespo and Álvaro Pérez, aka El Bigotes (the Mustache), were found guilty in connection with a section of the Gürtel case known as Fitur, involving embezzlement, influence peddling, bribery of public officials and conspiracy in the Valencia region. Judges have handed down a total of 11 convictions, according to legal sources familiar with the case. Milagrosa Martínez, a former Valencia government official under then-premier Francisco Camps, has been sentenced to nine years, while Rafael Betoret, the former head of the tourism department, received a six-year sentence. 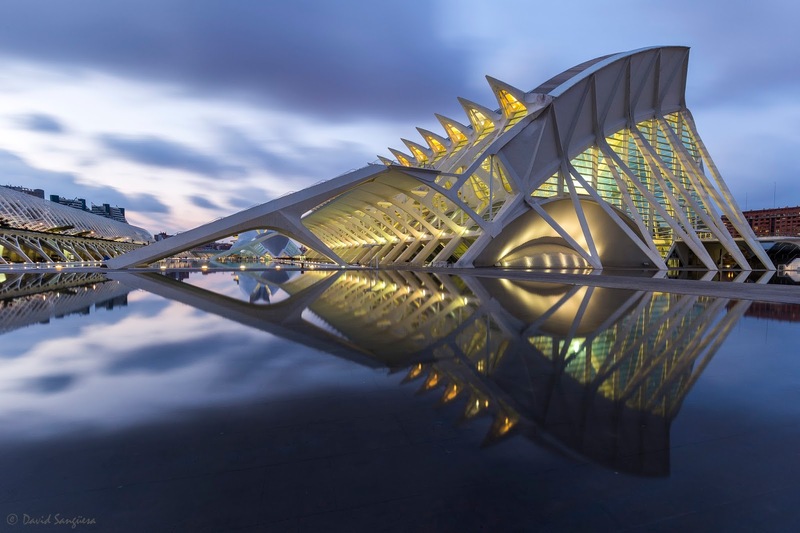 The court reached its decision after examining five years’ worth of organizational activities for the Valencia pavilion at Fitur, Spain’s premier tourism fair, and at lesser events. 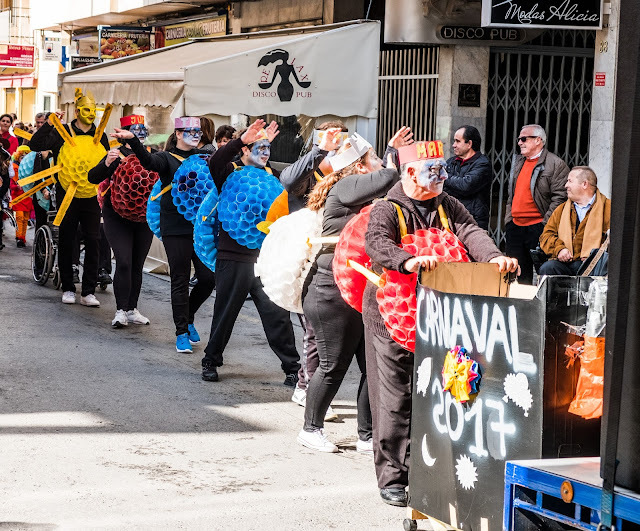 The government contracts to organize these events were all awarded to Orange Market, a company that is part of the Gürtel network of businesses that paid officials in return for favours. The sprawling Gürtel case involves a corrupt business network that operated across six Spanish regions between 1999 and 2005. 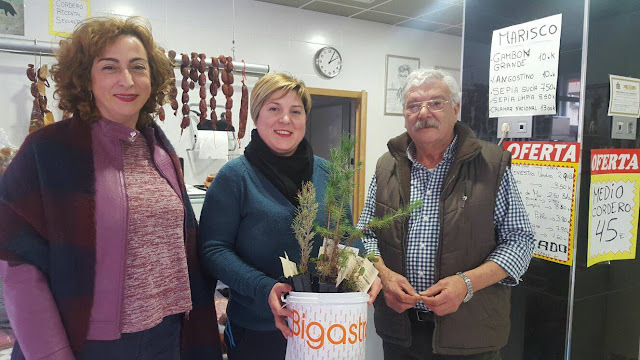 It was allegedly run by Correa (whose surname loosely translates as belt, or gürtel in German), a businessman who cultivated relationships with PP officials, allegedly offering them gifts in exchange for government contracts in public works and event organization. At the height of his power, Correa went by the nickname of Don Vito, after the character in The Godfather. With nearly 200 official suspects, it became the largest pre-trial probe in modern Spanish history and was broken up into sections to facilitate the investigation. The main trial began on October 4 at the Audiencia Nacional, Spain’s high court, with 37 people on the dock. One of the ramifications of the case involves the possibility of illegal party financing by the PP. Secret accounts kept by former treasurer Luis Bárcenas suggest the existence of a slush fund within the conservative party. In addition to his prison sentence, Correa was fined 3,918,500 Euros , Crespo - 3,913,650 Euros and Pérez -3,920,400 Euros. This in not over, there is more to come. In particular, the "B" account of the PP, which Bárcenas kept, showed payments to many high ranking members of the ruling PP including the President, Mariano Rajoy. Time to draw the line? 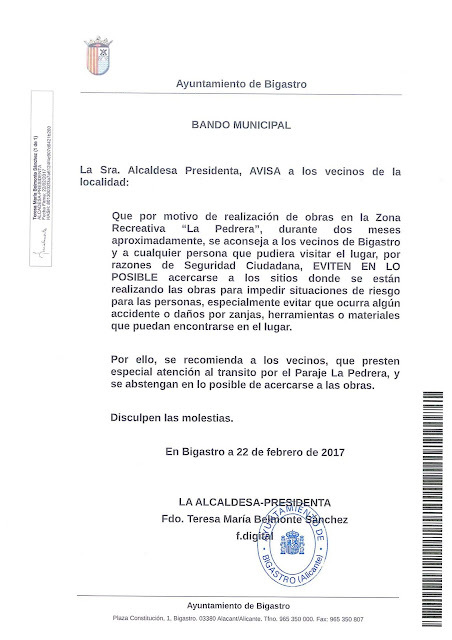 The beach side houses at Babylon beach in Guardamar del Segura have been a contentious issue for awhile now. The pathway in front is dangerous in parts and some of the houses are an eyesore. The storms this winter brought tides up to 4m in height causing further destruction. Many of the old houses are now in ruin. Two of the political groups in the town, Queremos Guardamar and Círculo Podemos, want the situation resolved. The houses only remain due to a concession in the Coastal Law which the Territorial Service of Coasts of Alicante believes should now be revoked. The trouble is that nobody wants to say that the houses should be demolished so does that mean that they will remain? Yesterday was blustery. I'd put the covers back on the furniture outdoors only to find them blown off again. Today it is calm out there so, yet again, I can cover the furniture. 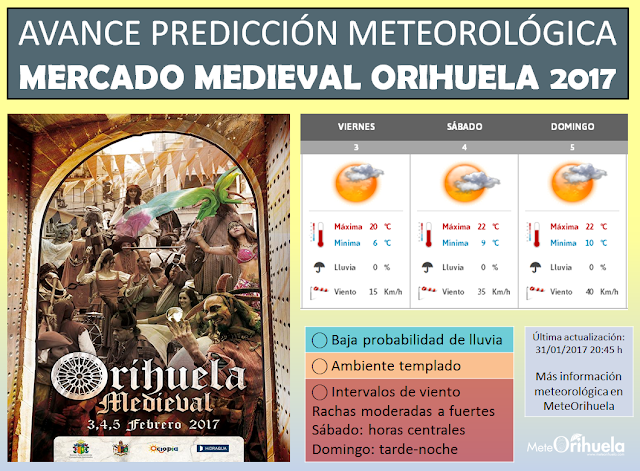 Looking at the forecast from Meteo Orihuela, it might be a good idea because rain is forecast for Saturday and then again on Monday. Judging by other forecasts though, it will not be the heavy and persistent rain we had weeks ago. Do they not have standards? I well remember taking a party of Liverpool schoolchildren to a campsite in the South of France. In the mornings the girls would put a dressing gown over their nightclothes and go down to the cafeteria for breakfast. I did wonder what the French tourists staying there would make of it. Still, that is probably how these young ladies would normally be dressed for breakfast at home At least these girls were not out in the street. We regularly see Spaniards in the streets of Bigastro out to buy a baguette or other morning shopping wearing a dressing gown and slippers. 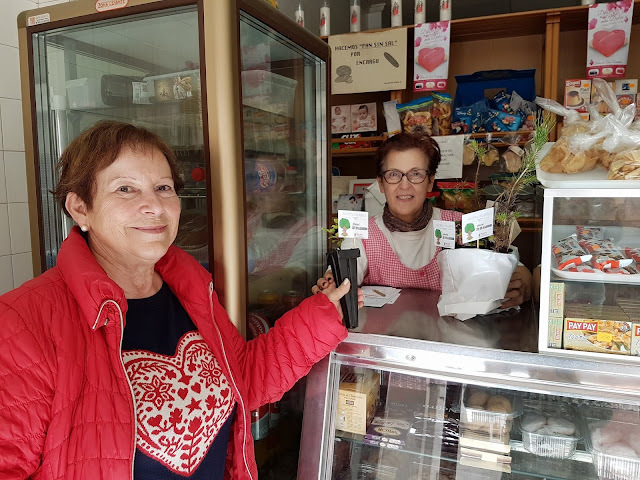 However, I have never seen anyone in a cafe in pyjamas but apparently that is a commonplace way to dress at the Los Monaguillos cafe in Mármoles street, Malaga. The owner decided that it was no longer acceptable for women to be in his cafe mid morning still dressed in their sleepwear and put up a sign telling them so. Some have either ignored the sign or just missed it and still turn up unsuitably dressed. They are served but politely made to stand outside for their morning churros. That was some wind that blew yesterday and looking at the graph you can see how it came from nowhere. It reached its peak at about 2pm in terms of gusts and then started to calm. However, spare a thought for those in the north of the Province where the highest recorded speed was 163 kilometres per hour (over 100mph) in the Reconco mountain range. Speeds of 142 were recorded at the Castle of Misrat, in the Valley of Gallinera, and 134 km per hour in Gaianes. 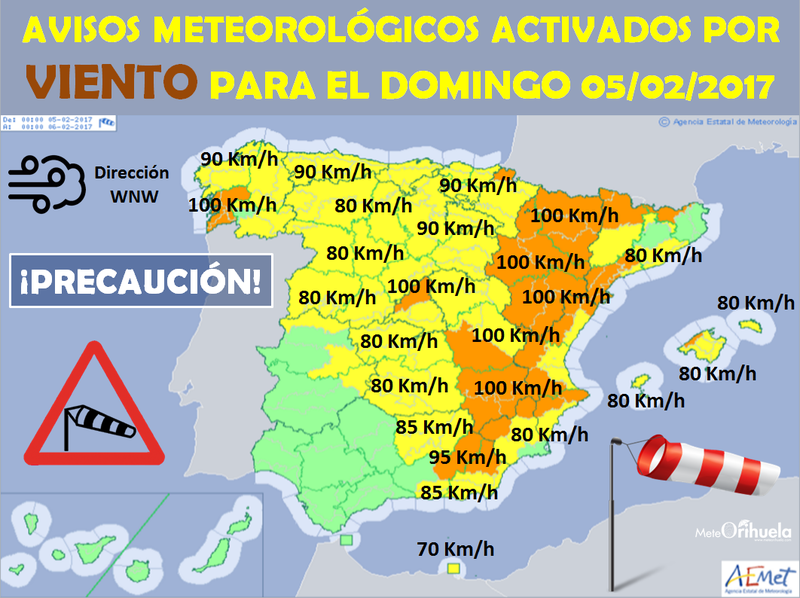 The wind also reached 124 km per hour in Agres, 118 in Xixona, 116 in Parcent, 113 in Algorós (rural part of Elche), 109 in El Poble Nou in Benitatxell, 108 in Ibi and 105 in Benissa, According to Avamet and Meteoclimatic data. Of course, to add to our problems here, we had a power cut. At first it flicked off and came back on - that happened a couple of times. Then it went off and stayed off for an hour or so. Bear in mind these are maximum wind speeds for gusts. For Orihuela from MeteoOrihuela, the most reliable forecasting for this area. Let us put that into perspective though, 35km per hour is the equivalent of less than 22 miles per hour - hardly a gale but still strong for here where winds are normally less than 15 km per hour and of course there will be stronger gusts to disrupt the Medieval Market. . In a normal year, Spain supplies more than 50 per cent of Europe's vegetables during the winter, shipping more than 100,000 tonnes a month of lettuce, tomatoes, cucumbers, peppers and between 50,000 and 100,000 tonnes of other vegetables including cauliflower and broccoli. It may have escaped the attention of those in Britain but this year we have had a particularity bad winter We started with a very dry autumn which was followed by heavy rain and even snow. The bad weather has reduced harvests by an estimated 60 per cent, with production wiped out across the Mediterranean, including large swathes of Italy, Greece and Spain. Worst effected are those crops like potatoes which have rotted in ground soaked with water but other crops like courgettes, broccoli and lettuce have also suffered. Reports show that some supermarkets in the UK are restricting customers buying certain vegetables and at the same time hiking up the prices. 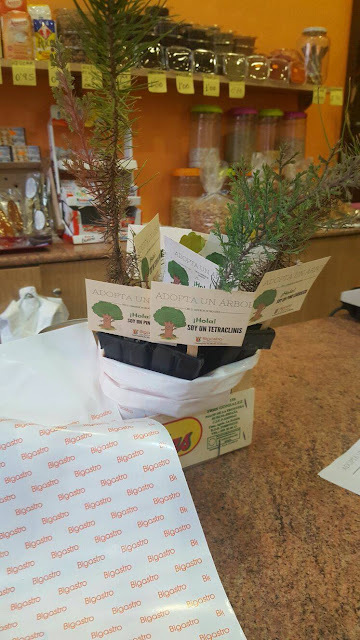 Spend money in the local shops over the next three days and you will be able to adopt a tree. Plant your adopted tree in your garden (not in a pot). 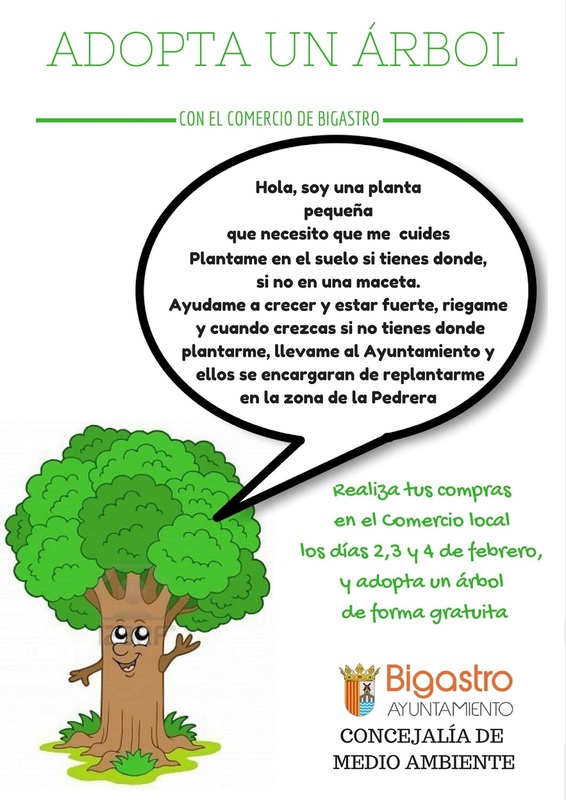 If you don't have space for it, the town hall will plant it up here at La Pedrera for you. There you go, decision made. Betty thought we might be better visiting the Medieval Market on Saturday when there will be more going on. The weather forecast though shows that we could be battling against the wind on Saturday and even worse on Sunday. Two years ago, when it was windy, a number of stalls were wrecked and some packed up rather than risk damage.